This unit located on second floor at The Summit has been completely redecorated. It features a king-size bed in the bedroom, a set of bunk beds in the hallway, and a queen-size leather sofa and leather rocking recliner in the living room. Furnished with a TV/DVD/VCR in the living room and the bedroom, mirrored walls, private telephone line with answer phone, and fully-furnished kitchen. This unit has a washer/dryer in the unit. Large balcony with a panoramic view of the Gulf. For the comfort of all our guests, this is a Non-Smoking unit and No Pets are allowed. I am retired after 25 1/2 years with Dept. of Postsecondary Education in AL as a counselor for Two and Four year colleges. I live in Dothan, AL and visit Panama City Beach often. I have one daughter, a son-in-law and three grand-daughters. I have owned properties in Panama City Beach, FL since the late 80's. I have owned property at the Summit since 1996. This property has a small restaurant 'Bikini Bobs' that has great food and drinks. Also, there is a tiki bar, and a small store where you can buy items like bread, milk, eggs, etc. Right in front of the beach! This unit is on second floor right in front of the beach. It is close to elevators and stairs so easy to use either. This unit is supplied with all kitchen needs because it is rented to winter guests. It has all you need to cook all major meals but most guest enjoy the restaurants while on vacation in the Summer. Large television is livingroom and small in the bedroom. Pool, Hot Tub or Jacuzzi, Sauna, Charcoal BBQ, Two large pools, Two baby pools, Sandwich shop, Tiki bar, store. Please call (334) 714-1109 or email beachgalpc1@yahoo.com. This property worked out well for our three family members. Note that condo only has one shower. The location on the second floor and use of stairs saved a lot of time. Great view of pool and gulf from balcony with pool far enough away to minimize noise. The Summit is somewhat dated and there was a water spot with mold on the living room ceiling from leak above. The security at the Summit was very good with wristbands required. The two comfy beach loungers which are included were the best. Parking pass required to get into guarded lot and parking is plentiful. Myra was very responsive to questions. So sorry about the spot in the ceiling. That is due to another owners leak in their unit. It is hard to get in patched in the summer months due to all the rentals in the summer. There’s someone checking in and out on Saturday. Thanks for letting me know that it hasn’t been repaired. I will get that repair done ASAP. Thanks so much for the rental!! Very clean and updated. I’ve stayed at The Summit for many years and this unit was by far the best. The Summit Room 207 was dated, but nice. I wished there were two full baths but apparently, there is a Jack and Jill shower/tub (be aware) because of privacy issues with kids and teens. Kitchen was well stocked with appliances including washer/dryer, and dishes/bowls, cutlery etc. the veranda is spacious with nice seating. Watch out because the sliding glass door might lock you out when pushed in all the way. Perfect location to walk to restaurants, events, club, etc. Will do it again! We were on the 2 Nd floor, which made is easier to go up and down the stairs to the pools and beach. We loved the pools, hot tubs and the little restaurant that was on site. It was good food and very cheap prices. The room was clean and to our standards. We could have used an extra blanket. Also, it did not have a blender. We bought one at Walmart. Walmart is very close to the condo. We will definitely stay again. Very nice place and right on the beach. I am so sorry about the blanket and blender. There were both there the last time I checked the condo. With summer, it is reserved back to back so it’s hard to check on it. I’ll be glad to refund your money! So glad that you all had a nice vacation. Just call me and let me know the cost you spent! Our family recently had a wonderful time staying in Myra's condo! The unit was exceptionally clean. The furniture and beds very comfortable. Thanks for a well supplied condo! We will be back again. I would like to thank Myra for all she did for us! She is great and the condo was amazing! 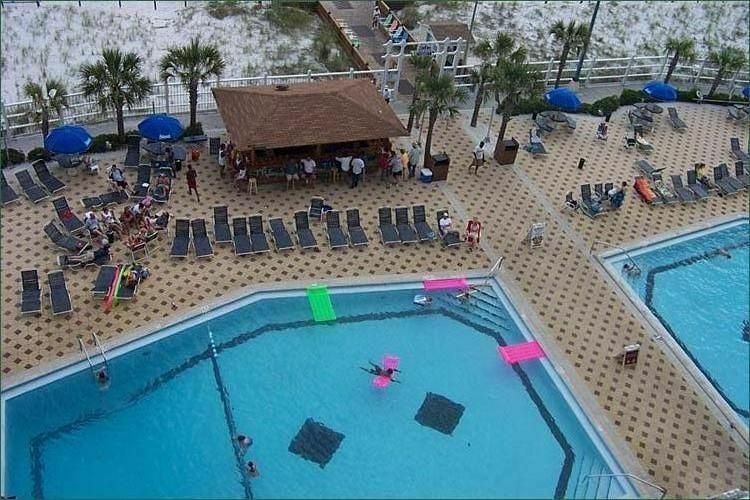 If you are looking for a place to stay in PCB, this is it...location is great and accessible to many of the attractions. I couldn't have asked for a better place or a better person to rent from...thanks Myra!